Hello... 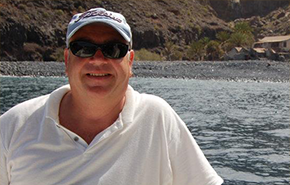 I'm Brian and I would like to welcome you to Splash Gomera. We are a small, friendly and relaxed Dive & Watersports centre in Playa Santiago, on the Canary Island of La Gomera. We offer Diving, Snorkelling, Kayaking and Stand Up Paddleboarding along with PADI diving courses suitable for beginners through to professionals. We are just 40 metres from the beach and 600 metres from the harbour where our boat is moored. What & where is La Gomera? La Gomera is the undiscovered Canary Island diver's dream with undamaged dive sites and an average water temperature of 22°C all year. One of the smallest Canary Islands, La Gomera is not a tourist centre. It is still a tranquil and beautiful island setting that offers visitors a host of activities that encourages walkers, nature lovers and divers in the know..
We offer year round diving for all levels of experience. We have over 20 dive sites within 15 minutes ride in our RIB “Splash” and we are constantly exploring new sites as we find them. 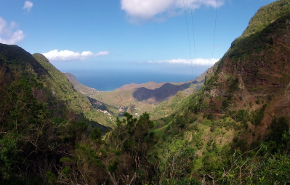 La Gomera has 92km of unexplored & un-dived coastline. For the more experienced & adventurous there are drift dives, caves & deep reefs to explore. With sea temperatures between 18°C to 24°C and beautiful clear blue water. 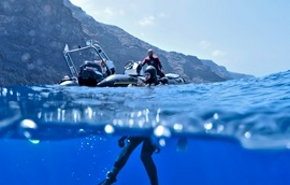 La Gomera offers some of the best diving in the Canary Islands.